We value the time you can commit to Jubilee USA. There are numerous ways you can be a part of the movement to cancel all debt. From simply reading our listserv and participating in the monthly actions to starting a Jubilee Group or becoming a Jubilee Congregation, we appreciate any involvement from you, a person of faith and conscience. We have several different ways for you to get involved, all catering to your schedule and the amount of time you, or your organization, is willing to commit. 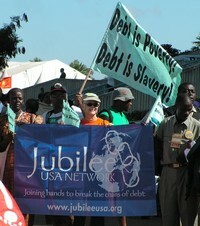 Take action, join the economic justice movement and get involved today! Join Our Mailing List - This is an easy way to keep updated on Jubilee Actions, Campaigns, Newsletters and recent wins! Join a Monthly Conference Call - Learn more about what Jubilee is up to in our month conference calls and about ways for you to get involved. 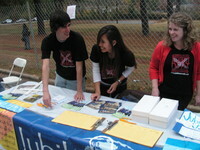 Volunteer - Learn about ways to help out the Jubilee offices in DC! Bring Jubilee to Speak to Your Community - Bring Jubilee to your community, group, organization or congregation! This is a great way to learn more about the Jubilee movement. Have a Jubilee Action Party - Host a Jubilee Action Party to get your local Jubilee supporters involved in our current actions and campaigns. These are a great opportunity to bring together current and potential supporters of the Jubilee movement to learn more about Jubilee and to take action in your local community! Become a Jubilee Congregation - Get your faith community involved in Jubilee by becoming a Jubilee Congregation. Your congregation will receive faith and worship materials, educational materials, our newsletters, action alerts and a Jubilee banner to hang in your congregation's halls! Start a Jubilee Chapter - Get your whole community involved in Jubilee issues by forming a Jubilee Chapter. 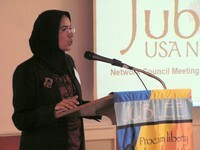 These are special groups are dedicated to Jubilee issues and are an integral part of Jubilee USA. Become a Network Council Member - Jubilee's Network Council is a group of organizations committed to furthering Jubilee's mission and goals.